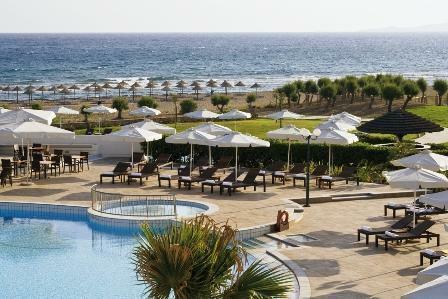 Candia Maris Resort & Spa Crete Heraklion Airport , Hotel Greece. Limited Time Offer! The Candia MarisRead more Resort & Spa Crete has all the services one would expect of a five star hotel in Heraklion Airport : Restaurant, Room Service, Bar, Front Desk 24hr, Tennis Court, Newspapers, Non Smoking Rooms, Laundry services, Breakfast Room Service, Free Parking. This establishment is more of a Luxury hotel .Located west, 13 minutes by car distance from the city center, this hotel at Andreas Papandreou Street 72 is the ideal pied-à-terre to take advantage of all the wonders of Heraklion Airport , whether for a few days or for a longer stay.This hotel offers a unique service : garden.Take advantage of the sauna which is available at the hotel.This hotel offers high speed internet.Practical information:This hotel has a free parking. Overlooking a private beach in Ammoudara, just 10 minutes from Heraklion, this beautiful resort offers a huge spa and 4 pools, providing a tranquil setting for a relaxing holiday.